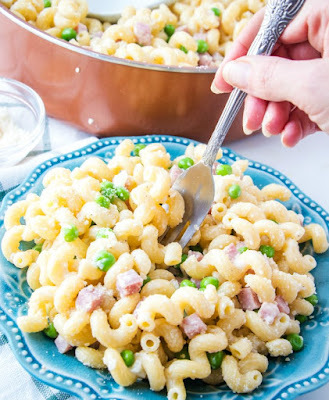 This all in one meal is a delicious combination of ham, pasta, peas and just enough creamy Parmesan cheese sauce. 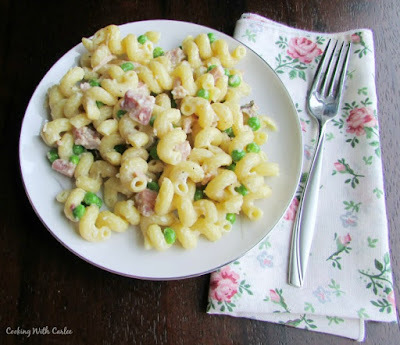 It is a great way to use leftover ham and is sure to have everyone asking for seconds! This pasta dish is perfectly simple. 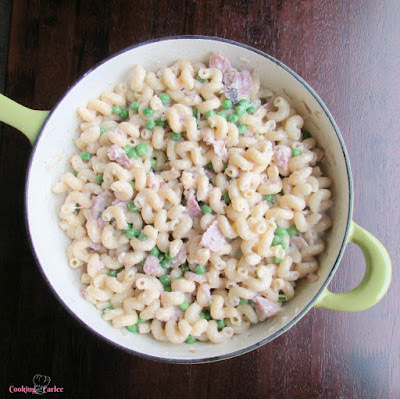 It is a great way to use up some leftover ham and turn it into a comforting and delicious meal! There is just enough cream and Parmesan cheese to bring it all together and the peas add a nice bright pop of color and sweet flavor. It is so simple to make and is one the family will love! Why is it that spring and winter always seem to have a bit of a battle this time of year? After a week of spring being in full force, winter is rearing it's ugly head again. It's like spring came in and gave winter a punch right in the sweet spot. Winter was dazed and looked down for the count, but popped back up just in time to extend the match. I don't know about you, but I am ready for spring to stay. I've had enough of the back and forth between nice weather and cold. Our daffodils came out and bloomed and it snowed two days later. Our blackberry bushes are getting leaves and our strawberry patch was greening up too. Hopefully the subsequent freeze didn't set anything back too far. That weather man of ours likes to keep us on our toes! All it takes is a few warm days and for the grass to start to green up and my tastes start to change. After a long winter of soups, casseroles and braises, I am now ready for quicker, fresher and easier meals. Peas are one of those early spring vegetables that is always a favorite. There is something about a pod of sweet peas straight from the vine. You don't even have to cook them. Of course, that is a taste that is hard to come by and it is a bit early for them. But really frozen peas are a good substitute. Ham is another dish that says spring to me. It isn't necessarily an obvious spring choice, but with Easter coming up there is soon to be plenty of hams on people's tables. 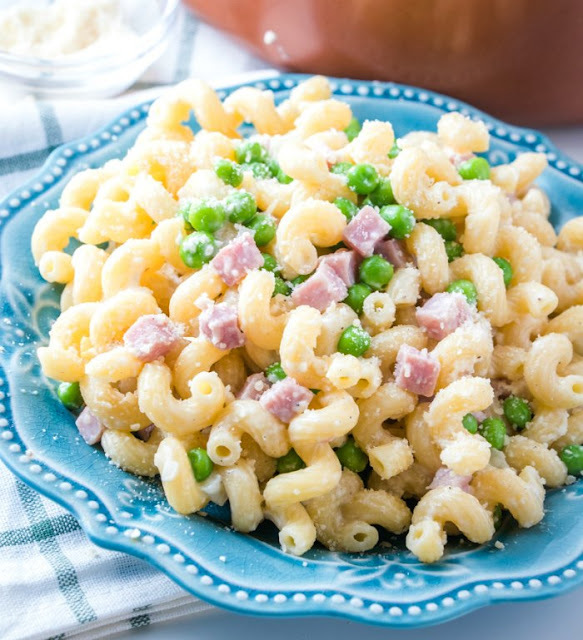 This Simple Pasta with Peas, Ham and Cream would be a delicious way to use some of those Easter leftovers. I love how simple and flavorful this dish turns out. The smell of the butter, onions, garlic and ham cooking draws you in. Luckily at that point you are just a handful of minutes away from a delicious meal. Some dishes like this make a heavy sauce to coat everything. I wanted just enough cream to give a very light coating to everything. 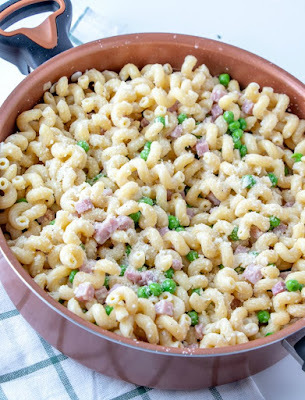 To me the sweet fresh flavor of the peas and the salty savory ham should shine and not be masked by too much cream and cheese. Don't get me wrong, I love cream and cheese, but in some cases moderation actually is better. I am not the only one that likes it just like this. Not a single one of us was super hungry when we sat down to eat, but all three of us had seconds. I quickly packaged up the leftovers in lunch sized containers to keep it for myself. Lunch this week is going to be delicious! As you can see, this dish has become a spring tradition for us. If there is leftover ham around, this is bound to be on the menu. Honestly, we eat it all year long! 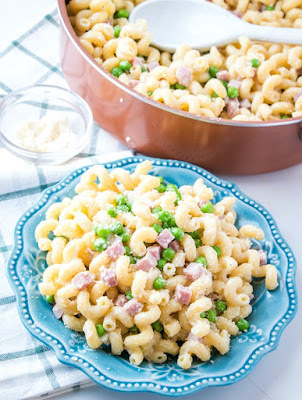 We always have frozen peas on hand, so any time there are some cubes of ham in the fridge this has a good chance of being on our dinner menu! We also love celebrating spring with my lightened up version of creamy pea salad or maple bacon asparagus salad. Now I am wondering. What are some of your favorite spring dishes and flavors? Is there anything that really signifies spring for you? Boil noodles and cook to al dente according to the package directions. Meanwhile, in a large pan melt the butter over medium heat. Add the diced onion, ham, garlic and a pinch of black pepper and cook until onions are soft and translucent. Stir in chicken stock and bring to a boil. Reduce heat to low and stir in cream. Simmer for 3-5 minutes. Stir in pasta and continue to simmer until pasta is coated. Add peas, stirring to combine and then remove from heat. Add Parmesan cheese and adjust salt and pepper to taste. Serve immediately with an additional grating of Parmesan if desired. This is the sort of sunday night supper that my kids would demolish!! Thank you! We definitely did a number on it ourselves! You have daffodils and a greening strawberry patch. Jealous! Your pasta is a great way to use Easter dinner leftovers. Looks delicious. It would definitely be perfect for Easter leftovers. Somehow our daffodils did ok through the last freeze and hopefully the strawberries pull through too! I missed lunch today and my stomach is grumbling at the sight of your fabulous pasta!! YUM! I love pasta and peas together! The ham is a nice addition. It all just goes so nicely together, thank you! A perfect dish for using up leftover ham from Easter. Thanks for sharing. Love this dish and pinning for later! Yay Spring!! Thanks, I hope you love it! Love this! What a wonderfully Spring dish and I'm pinning this to make! I love how creamy it looks!! This would make a nice simple family meal. Thanks for joining us again Carlee! Looks delicious! I can't wait to try it. Hi Carlee, it is the time for lighter meals now, I am still using my slow cooker, but it won't be long before it is back in the cupboard for the summer. I do miss fresh sweet peas, my Dad used to grow them and I spent many an hour shelling them (three in the pot, one in the mouth sort of shelling). We get plenty of fresh beans here, but I don't think I've ever seen fresh peas. Maybe it's the climate? This looks like a nice light meal, perfect for warmer weather. IT is funny how by the end of each season, I am looking forward to the next season's food. Come September I'll be ready for stews and braises again but now I only have eyes for grilled meat, salads and peas! I'm with you on loving the peas come spring. This dish is pure comfort. We love a pasta dish with this combination! Hope you have a fantastic weekend and thanks so much for sharing with us at Full Plate Thursday. I am so glad you are feeling better! This would definitely be a comfort after a bug. That pasta looks great, I just love peas, I bet it'd even taste good cold. I love peas this time of year too... after a whole childhood of thinking I hated them! I love pasta and peas. I make something really similar to this with bacon and peas and we love it. Thanks for sharing your recipe on Merry Monday. Oooh, bacon would be good too! I agree I don't like a salad with too much dressing. I like to be able to taste everything! I think that a small amount of dressing allows you to do just that! Thanks for sharing. Happy Spring.